Turns out I’m the prime candidate for internet sponsored posts. In the past 2 months I have purchased 5 things from shady instagram shops or those “50 Types of Unicorn Erasers under $10 on Amazon” lists. That doesn’t sound like that much typed out, but I probably bought 8 things total from any shop. 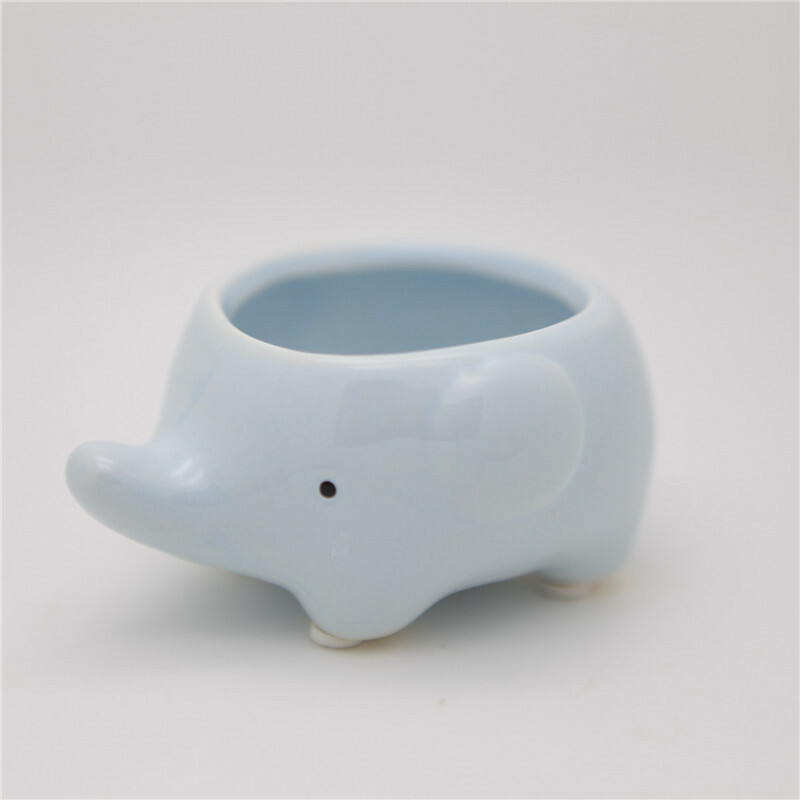 It’s worked out relatively well: highly complimented skirt, containers in a variety of animal shapes, several items that were bizarrely sized but garnered a full refund without even returning! So it comes as no surprise that after a few months of constantly seeing the ads for Tieks’ rainbow of ballet flats, I was intrigued. Out and about I started to notice people with the teal soles, namely coworkers who spend their days on their feet like me. Everyone swears by them and several others were buying them. I’m not a shoe fiend but I like fun shoes and rarely wear the same pair on back to back days; however I also almost completely stopped wearing heels, so comfy flats are a must. Plus I’ve started to notice I’m affected by shoes that might seem comfy but don’t have enough support for my back. So something cute and comfy in between heels and orthopedics are a necessity. The conflict here is the price tag. $175 regular, $245 metallic (which I of course wanted). Most of the shoes in my closet are at least 10 years old, so I have no problem investing in a pair of shoes, but I need to know it’s worth it. I joined some Facebook groups and talked to the coworkers again and everyone was a fan. So I pulled the trigger right before the school year. My shoe size varies and I went with a 7. When the 7 was too tight, I contacted customer service and had a size 8 in about 2 days, and they fit. The first day the Tieks looked cute and got at least 1 compliment, but within a few hours my feet felt not great. Not painful or the major heel rubbing girls are all too familiar with, but just kind of tight. Not a shoe you’d ever forget you were wearing. I decided to withhold judgement since I’ve been wearing flip flops all summer and all real shoes feel a little funny. About a week later, wearing #2. Again, fine. Not uncomfortable but couldn’t wait to take them off. I get how breaking in works, but it just really hasn’t been something I had to do for most of my favorite shoes. I consulted the main Tieks Facebook group I had joined. My question: does everyone have a breaking in period? These are not comfortable. Oh yeah you have to break them in. It usually takes me a few months before they fit like a glove! I average 50-60 hours breaking in time. You could get them professionally stretched. Here’s a shoe stretcher system you can buy. I just paid $245 for flats and part of the deal is spending more money on a cobbler? I posed this comment to the group. Doesn’t it seem excessive to spend $245 and then have to go to great lengths and expense to be able to wear them? A cobbler stretch is pretty standard around here. I’ve been stretching mine for 3 months and still can’t wear them. That is not how things work. You pay many dollars to get things that work correctly without additional expense. You don’t pay more dollars so you can spend more dollars. I can deal with a shoe that takes a few wearings and I can understanding spending money on shoe repair. New heels, resole-ing, I’ve done all those things for shoes I loved that were worn out. But I had also done those things after I wore them out. And they were probably a lot cheaper. This is not like a Chanel suit that your grandchildren can wear. These Tieks are cute but they probably wouldn’t be in my top 3 favorite shoes even lookswise. That award goes to the GAP flats I’ve had for 10 years that were probably $40 (combined for 2 color variations). I didn’t have to take those to be stretched or live with bleeding feet for 2 work weeks. These Tieks were supposed to replace those in the rotation and I thought I’d splurge on myself, but it’s awfully hard to embrace the splurge when the shoes with the holes are more comfortable than $245 worth of material. I have no judgement about what people spend their money on (sort of…but at least in this situation no judgement). What I can’t understand is spending the money and not expecting anything. Why are people lamenting how they can’t afford a pair but then being willing to save money for them and toss more money to make them fit? Am I not cool enough for the Tieks cult? Inquiring minds want to know what I’m missing. Here it is. Your first 5 (or last 5) favorite books of the summer, reviewed! I can’t believe anyone had anything positive to say about this book. Take several awful people and a gross premise and have them talk about how to be even more insufferable for 200 pages. 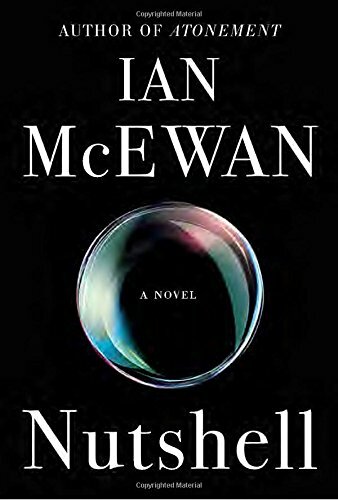 It’s as if McEwan thought “I have a good rep in the literary world, let me write the worst possible book and see if they’ll fall all over themselves to tell me how great I am anyway.” The only plus is that is wasn’t that long. I loved Atonement, and there may have been one other that I read that I liked, but it’s all be downhill since. I can’t believe anyone has more than ~1 good thing to say about this book. The emotional struggle of the old man tugged the heart strings. Being at the sunset of your life and wondering what it’s all about. At 36 I have plenty of those moments, so I can only imagine 50 years from now. But the story was confusing and the pay off was weak. Avoid. I have nothing to say about this book because nothing happened. Why was this woman in the hospital? Was she actually abused? Was her mother abused? Was she just a jerk? What did she write? What happened to her marriage? None of these questions will be answered. I didn’t even car enough to get a full size picture of this one. I wanted to punch this book in the face. 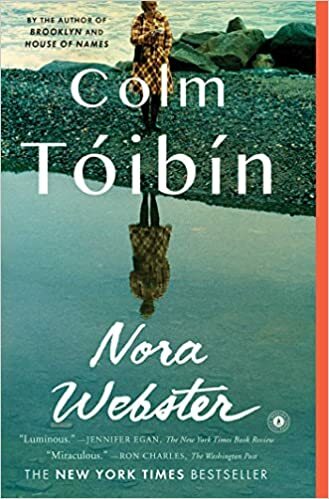 Here’s an obnoxious person who writes about her averagely interesting life with ok skill and interacts with other unappealing people and then suffers a terrible tragedy and then the book ends with little to no progress. She is so wrapped up in this life she barely notices what’s happening to anyone else she “cares” about. It also includes an implied cautionary tale that if you try to live your life before having children, you will be punished, and you will encounter people who will make you feel like any suffering is your selfish fault for waiting to have kids. 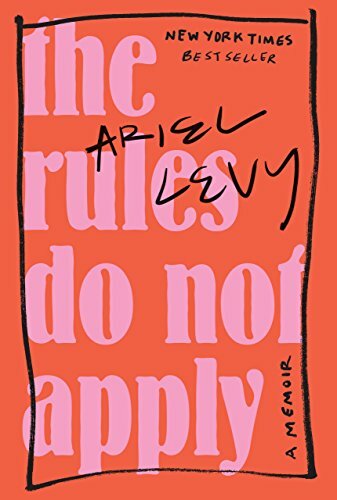 I don’t 100% think this is what she was suggesting, rather it was her own feelings and what she interpreted from her encounters, but for someone on the edge of child bearing years, it was more of a knife twist that you want for a beach read. This book was fine but it sticks at the bottom of the list because Brooklyn (both the book and the movie) was such a lovely, simple story that exemplified, for me, what historical fiction can be. I see the attempt to tell the simple story of a woman navigating family life, and I appreciated some of her breaking out of her old life, but it didn’t have the joy or progression that it needed. With a day to spare I did it. I read 20 books on my summer vacation. Last summer I read 17 without trying so this year’s goal was 20 and mission accomplished. They weren’t all good. A few I returned without reading. In fact many stunk, not because of my choices just because. Contemporary fiction these days is tough for me. It either tries to be unique and turns out insufferable, it reflects the ennui of our currents times and is depressing or it just tries too hard in general. 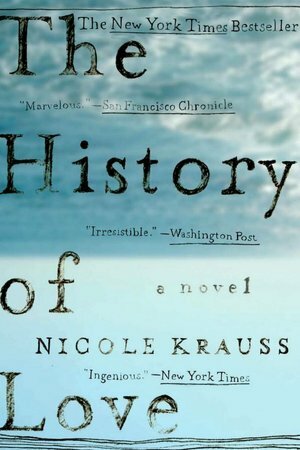 So I lean more towards historical fiction and even young adult. Surprisingly two of my top rated came from Caribbean authors, something I’d never really explored before. And my top rated seems the most depressing but was the most refreshing. Being able to read so voraciously is probably my favorite part of having the summer off. Visiting my friends at the library (the paper and human ones) brings so much opportunity and exploration. It’s a ready-made conversation starter and though it’s small talk, there’s an intimacy in knowing what someone likes to read and sharing ideas. The smell, walking out with a stack of new books, considering all the activities…its nerd heaven. Plus going to the library supports an important public service! I read all day long every day but outside of the summer I probably will read 3 actual books. All the information available every day inundates our mindspace but how beneficial is it? At least once a day I mention a story but I haven’t read the whole thing or I didn’t comprehend it because I clicked through to something else that popped up. My brain is full of thought bubbles but no thoughts. Reading books, holding the heft of the text in my hand, gives me full thoughts about complex lives and conflicts and resolutions. I keep track of my books now on goodreads. And I have a lot of questions about the hundreds of people who write hundreds of newspaper-style reviews of everything they read. Or absurd reviews like “this book was about clowns, which I hate, so the clown story did not appeal to me. One star.” However, I’m going to give you my 20-book review to save my achievement for posterity. Coming soon in order of least to greatest! Old books, new books, NYT bestseller books…any guesses on #1?? This is a story of surprises and taking chances. Or rather, not over thinking. Or not thinking at all. Chances are really just moments when you’re not overthinking, aren’t they. Either you do something immediately or you weigh the options and decide to go with the risky one despite the downsides, which would usually drown you in anxiety. Just a few days ago another person asked me when I last really had fun and I couldn’t think of it. I was searching for a memory of a crazy-night-out-omg-this-is-so-much-fun fun. The “lets go to another bar because it’s so much fun” not “oh it’s almost 11 we should go home” fun. The fun where it hits you that you’re really blessed to have this life with these people in this place. It’s been awhile since I’ve had that kind of fun, yes. Honestly though, after age 19 how much does that fun really come around, especially unaccompanied by drugs and/or alcohol? It’s so overwhelming because it’s so rare. You can’t plan for it. And you can’t assume the lack if it means a lack of fun in your life. I was shocked by my own admission Id been having fun because I haven’t been spinning around to the music screaming this is so much fun. But this IS so much fun. Every day I have my tea outdoors with a breeze off the ocean. I wake up and my dog is sleeping next to me making the faintest snore. I can go float in the ocean, or read a book, or take a nap, or wander around chatting with new people. I go out a few nights a week with family or friends new or old. I have nothing immediate to worry about. I think my expectations for happiness are too high. Everyone’s are. If my goal is to be happy, I expect to be happy all the time. When I feel sad, explicably (new word) or inexplicably, everything plummets. I’m so alone and I hate my job and everything is ruined with no solution. There’s either excited anticipation, rare acceptance, or disappointment. And how could there not be. I’m constantly being inundated with posts on how to achieve this luxury budget vacation or what 19 kitchen gadgets I thought I could live without but can’t. There’s daily updates from friends, acquaintances, and frenemies about kids and husbands and the meal delivery service you can’t get because packages get stolen from your city apartment that you live in because you’re single and are afraid to buy a house in the suburbs alone because no guy would want to move into the girl’s house. Or worse, the emotions spiral of the update about the close friend being on vacation or seeing a show or being pregnant that you see on social media, cutting that much deeper because you don’t talk to them as much since they became real adults. The “what a single person sees on facebook” joke is everywhere, but it really does hit home. You deal not only with your own worries but the unavoidable comparisons that weight heavy and are hard to avoid. The goal, I think, needs to shift to contentment. Each day, some laughter, some comfort, some gratitude. Some concerted effort at being positive. Am I happy with my life right now? Maybe not. But I can be content in each day and take action to appreciate what I have and seek out what could be better. As my TJ Maxx dogs-in-pants pajamas say: Choose Happiness. I’m not the first to suggest these magic words–plenty use them for profit in all those ads and sponsored posts that pop between the 1st birthday pictures–but I’m the one that needs to put them into action. Writing is scary because it has feelings and judgement. If I write people will be able to see things about me and know what I care about and how I feel. The best way I’ve gotten around that is being self-deprecating, which is funny and not all bad but also not really real. Even talking about wanting to write is scary because it reveals something. It reveals real dreams and goals that aren’t happening and why? Because of me. Either I’m not trying or I’m not good enough but either way it’s on me. But if I never reveal anything–writing or otherwise–will I ever really feel settled and fulfilled? The fear of judgement keeps me from so many things. My other hobbies are weird/quirky but they’re things I put fractured time into, not my whole self, so it’s ok to joke about them being weird. Writing is time, and emotional energy, and feelings, and truth, and if they’re not accepted how can I be accepted? A man set up to fish in the surf at the water’s edge just a few feet from my chair. I never usually see these men catch anything. Which is reassuring because fish are yucky, and they can’t be in the ocean where I swim. However, within a few minutes he reels in a small fish, about eight inches head to tail at most. He throws it back after showing it off to his kids. A little later another one. Maybe the same fish. Fish aren’t known for their mental capacity. I walked over to inquire about this killer creature and he told me it was a kingfish. Then I asked how far he casts out. He said just past the breakers. Just past the breakers is just past where I swim. Sure, don’t worry. As if the absence of teeth could keep me from a slimy collision with a deadly bait fish. I tell others “we’ll cross that bridge when we come to it” but involuntarily maintain the opposite mentality. Maybe the murky depths actually shield me from my fears. They say seeing is believing but sometimes it’s easier to believe what we don’t see. I can float in the ocean all day until I see or feel a fish, then I can’t go back. At least for a few minutes. If you can’t see them they’re not there. A child pulling the covers over her head to hide from a monster. If you can’t see them they can’t see you. If you don’t check your email, work doesn’t exist. Closing your eyes as the airplane ascends to pretend you’re not hurtling through air in a metal tube. It’s easy to make yourself blind to reality if you want. Look, he’s not sick, he still likes his favorite ice cream. He went down the stairs by himself that one time without falling, everything must be fine. Maybe being blind to reality is what we all really need to thrive. At least for some of us. Every time we get in a car we risk our lives. Riding a bike is a delicate act of balancing inches away from a bloody curb. Tripping on a curb could end up in a concussion and blood clot in the brain. Who could step out of the house acknowledging all that’s really there with us, teeth or no teeth. Indoors, under the covers, away from monsters is the only safe haven. But then there would never be the chance to be enveloped by warm water, drifting softly on the swells. It’s a tightrope act teetering between hiding from danger to enjoy the beauty on the other side. You might start to notice some actual feelings and ideas appearing on this site. We’re heading for a slight shift…there are still plenty of complaints to be made about dating and navigating the world as a dreaded 30-something singleton. But there will also be some new musings on navigating life in general. And maybe just some musings in general on nothing in particular. My life has some holes. Sometimes it’s hard to discern the symptom of the hole from the cause of the hole, not to mention the solution to the hole. But regardless there are holes that have been there for some time. I’ve been unhappy with them, but I haven’t come close to finding a solution. Things I’ve tried have been band aids or wrong turns or maybe just dead ends, sometimes self imposed. I’ve taken some steps towards therapy and I’ve doubled down on exercise, especially yoga. Mediation is still a struggle for me, but I’ve at least accepted the idea of living with intention. I mostly fail, but I think about doing it. 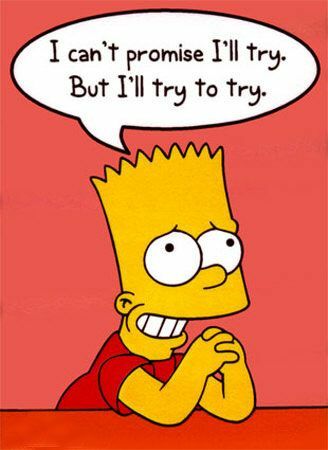 Thanks to Bart Simpson for my life’s motto. On a whim, I responded to a offer for Wisdom Coaching with a yoga teacher who really resonated with me. It sounds crunchy and kinda weird, but I needed a kick. I have all kinds of things I wanted to work on this summer, and the days were/are passing without any effort, meaningful or otherwise, devoted to them. Writing has always been my secret dream. Teachers and family told me I was good at it from early on, even when my early writing was just a crime series pitting my brother as the murderous main character. Despite my being painfully shy (or maybe because of it), teachers forced me into challenging myself–working with the grade ahead of me, entering contests, joining the newspaper… And it always came easily. In a few lines with a few choice words I could say what others took pages to say. I loved finding the right turn of phrase or going back to remove that errant comma. And yet I was and am afraid and stuck, so I just help other tiny people learn to write. What’s that cliche? Those who can’t publish force grammar on tweens? The glaring takeaway from my wisdom conversations was that I just needed to do something if I really wanted to write. But sometimes it takes an outsider to make that clear. Writing is scary. Going after something you really want is scary because what if it doesn’t work out? If I try and fail, I can no longer say it’s not happening because I didn’t really try. It means I really don’t have any choice but staying in my stinky job and and being only sort of happy. And writing is work. If I want to write in any real way I need to seriously commit to it. Not in my usual “I have to get this off my chest so ill blog every 4 months” way. In a “schedule dedicated writing time every day even if you have nothing to say” way. For 10 days, I completed 12-minute writing immersions. Some were based on prompts, some got skipped, some were based on thoughts and feelings of the day, some were based on random inspiration, some were based on the book topics that have been floating in my head searching for permission to land. But I’ll be continuing to work on this and debuting some “pieces” here. Anyone who stumbles by can feel free to add some constructive criticism. One day I may be a famous author and I can thank you, but if nothing else I can be a person who writes to cultivate the creativity that we all need to thrive, if not survive.